Many, but not all of our fleet are equipped with motorized lifts that can accommodate common wheelchairs or scooters. We are dedicated to providing exemplary service to all of our guests and in order for us to do so for our guests with special needs, we request a few small accommodations which allow us to plan ahead and assure your time spent with Historic Tours of America will be safe, convenient and efficient for you and your party as well as our other guests. The most important of these requests we make of you is that you provide us with adequate notice of your arrival and the time and date you’d like to take the tour or visit our attraction. A minimum of twenty-four (24) hours is preferred. This will allow us time to ensure that a properly equipped vehicle will be made available for your use, minimize your wait time and maximize your time spent seeing the best of the city you are visiting. Because we make adjustments to our schedule and vehicle assignments to assure the right vehicle is ready for you, we request that you arrive at our boarding location no less than fifteen (15) minutes prior to your requested departure time which allows us adequate opportunity to expeditiously and safely execute the loading process. To assure we can accommodate your conveyance (wheelchair/scooter, etc.) please assure that the maximum weight of the rider, any cargo and the conveyance do not exceed six-hundred (600) pounds when occupied and is no more than thirty inches (30”) wide and forty-eight inches (48”) in length. Because many of our stops are on busy thoroughfares and shared with other tour operators, we must limit the opportunities for loading and unloading to those that will assure when you load or unload, the exercise will be done safely and efficiently. 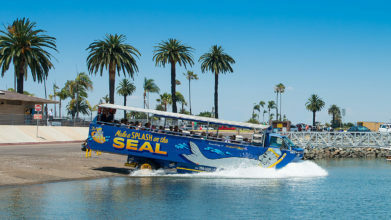 We recommend Stop A – Old Town, Stop C – Seaport Village and Stop I – Balboa Park for the convenience of multiple parking lots and ease of boarding. We request 24-hour advance notice by calling 619-298-8687. Please note that a significant amount of this tour requires traversing over uneven grounds and also includes historic sites and buildings with no handicapped accessibility. 24-hour notice is requested by calling 619-298-8687. This tour is accessible. All guests must arrive and check in at the Seaport Village location no less than 30 minutes prior to the tour. We request 24-hour advance notice by calling 619-298-8687. Please note the tour is accessible. However, the La Jolla stop is approximately a 20-minute travel distance to the Cove. To return to the stop, guests must travel up hill. Guests have the option of remaining on the trolley and continuing the tour back to Old Town. The Americans with Disabilities Act (ADA) Title III regulations defines a service animal as any dog that is individually trained to do work or perform tasks for the benefit of an individual with a disability, including a physical, sensory, psychiatric, intellectual, or other mental disabilities, such as guiding people who are blind, alerting people who are deaf, alerting and protecting people prone to seizures, or other tasks directly related to a disability. Dogs whose sole function is to provide comfort or emotional support do not qualify as service animals under the Americans with Disabilities Act. Sorry, no pets allowed. We request 24-hour advance notice by calling 619-298-8687. Old Town Trolley Tours looks forward to having you join us on San Diego’s best sightseeing tour. Safety first…courtesy a close second. This is our company motto and our #1 priority. The level of safety in our workplace is directly proportional to the effort each CASTmember expends. To this end, every CASTmember is dedicated to ensuring the safety of each and every one of our guests. It is our top priority to provide you with a safe, comfortable, secure, and enjoyable tour experience.